The upcoming book, Vintage Game Consoles, is now available for pre-order! 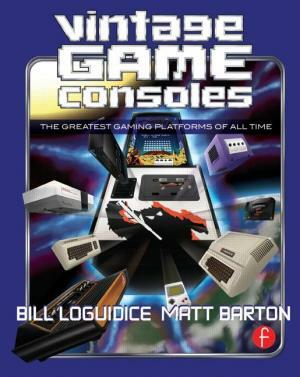 Vintage Game ConsolesI'm thrilled to officially announce that another one of my new books, Vintage Game Consoles: An Inside Look at Apple, Atari, Commodore, Nintendo, and the Greatest Gaming Platforms of All Time, written with Matt Barton, is now available for pre-order from booksellers everywhere, including Wal-Mart, Barnes & Noble, and of course, the publisher's (Taylor & Francis/Focal Press) Website. As always, my personal favorite place is Amazon, where you can buy it at a nice discount from the full retail price, plus, if the price drops upon the book's publication sometime in February/March 2014, you get it for the lower price. Of course, you don't get charged until it actually ships. What Vintage Games: An Insider Look at the History of Grand Theft Auto, Super Mario, and the Most Influential Games of All Time, did before it for software, Vintage Game Consoles, does it now for hardware platforms, covering 20 of the greatest game playing computers, consoles, and handhelds of all-time. This full color paperback and ebook is packed to the gills with well over 400 pages of content and 400 images. Nathan Strum's amazing cover art, inspired by legendary magazine, Electronic Games (the first I ever bought myself as a child and incredibly influential to my future path in life), rounds out the package. Also in early 2014, be sure to look out for My Xbox One, written with Christina Loguidice (the follow-up to My Xbox: Xbox 360, Kinect, and Xbox LIVE), and of course, published this holiday season, CoCo: The Colorful History of Tandy's Underdog Computer, written with Boisy Pitre. It looks like the publisher posted an image of the cover - featuring original Nathan Strum art - for our upcoming book, Vintage Game Consoles: An Inside Look at Apple, Atari, Commodore, Nintendo, and the Greatest Gaming Platforms of All Time. The book, which covers 20 of the greatest gaming platforms of all time and is the next in the Vintage Games book series, won't be out until early next year, but hopefully that awesome looking cover art gets you excited for what's coming soon! Check out parts 3 and 4 of the Portuguese translation of our Spacewar! (1962) bonus chapter from our 2009 book, Vintage Games: An Insider Look at the History of Grand Theft Auto, Super Mario, and the Most Influential Games of All Time. Don't forget that Vintage Games is available in its original English language version at Amazon and other fine retailers in both print and ebook variations, as well as in an Italian language version, found here. As a reminder, Matt Barton and I are also hard at work on a new entry in the Vintage Games series focused on the great platforms that powered those great games, Vintage Game Consoles: An Inside Look at Apple, Atari, Commodore, Nintendo, and the Greatest Gaming Platforms of All Time, for release later this year. Enjoy! Check out part 2 of 4 of the Portuguese translation of our Spacewar! (1962) bonus chapter from our 2009 book, Vintage Games: An Insider Look at the History of Grand Theft Auto, Super Mario, and the Most Influential Games of All Time. Don't forget that Vintage Games is available in its original English language version at Amazon and other fine retailers in both print and ebook variations, as well as in an Italian language version, found here. As a reminder, Matt Barton and I are also hard at work on a new entry in the Vintage Games series focused on the great platforms that powered those great games, Vintage Game Consoles: An Inside Look at Apple, Atari, Commodore, Nintendo, and the Greatest Gaming Platforms of All Time, for release later this year. Enjoy! Check out part 1 of 4 of the Portuguese translation of our Spacewar! (1962) bonus chapter from our 2009 book, Vintage Games: An Insider Look at the History of Grand Theft Auto, Super Mario, and the Most Influential Games of All Time. It looks like Juan Castro did a nice job and I'm looking forward to future installments. Don't forget that Vintage Games is available in its original English language version at Amazon and other fine retailers in both print and ebook variations, as well as in an Italian language version, found here. As a reminder, Matt Barton and I are also hard at work on a new entry in the Vintage Games series focused on the great platforms that powered those great games, Vintage Game Consoles: An Inside Look at Apple, Atari, Commodore, Nintendo, and the Greatest Gaming Platforms of All Time, for release later this year. Enjoy!